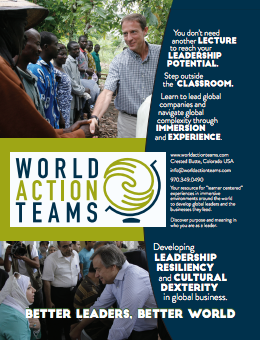 The mission of World Action Teams is to develop leaders who create value for business and society. We do this by partnering with corporations to design and deliver discovery experiences for leaders in rapidly growing global markets. If experiential learning is a way to bring intellectual content to life, immersive learning is being embedded in an environment in which you see both intellectual content and experience merging. This rich context puts the immersed learner in a place in which he or she quickly has a deeper, complete picture of what the challenges are. This immersive environment allows the learner to step outside his own frame of reference in order to see a different perspective. Immersive learning usually asks the learner to be something they are not. In more recent online tools it is putting you – or the avatar of you – into a setting of a simulated world. In this setting, you are immersed into the experience and navigate this from a virtual perspective. While technology is advancing in this space, it is still not a replacement. At Action Learning, during the Leader’s Court process it may be asking you to play the role of an attorney, witness, or judge. During a Search & Rescue simulation, it may be asking you to play the role of a emergency coordinator. From the perspective of these roles, you are more likely to see a truth or reality because your view is less likely to be skewed by your own perspective, you are essentially immersed in a role that limits your personal perspectives to stand in the way. Taken to another level, in World Action Teams when you are dropped into and immersed in the bustling environment of an outdoor market in a crowded city in China, you can now see why the traditional supply chain systems don’t apply, or better see how the Chinese consumers make decisions on product selection, negotiate, or how the more “collectivist” cultures barter. Immersive learning is often the most powerful mechanism to see past personal and cultural assumptions and deeply understand the reality of a situation, solution, style, and culture. It is experiencing the VUCA world first hand in unforgettable ways that stretches leaders in ways that they simply cannot ignore. Working together, corporations and social entrepreneurs can reshape industry and solve the world's toughest problems. - Harvard Business Review, From "a New Alliance for Global Change"